The completion of a building is always dependent on the successful coming together of the right materials, labour and design. Indeed, such are the uncertainties during a building’s construction, that it is always vulnerable to possible abandonment before it is finished. 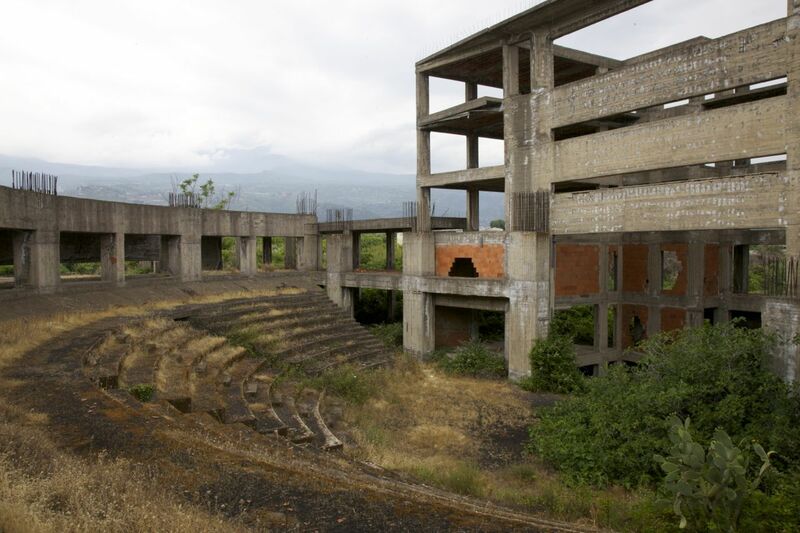 In the town of Giarre on the southeast coast of Sicily, such abandonment has become manifest in a disproportionately large number of half-finished grand public buildings. 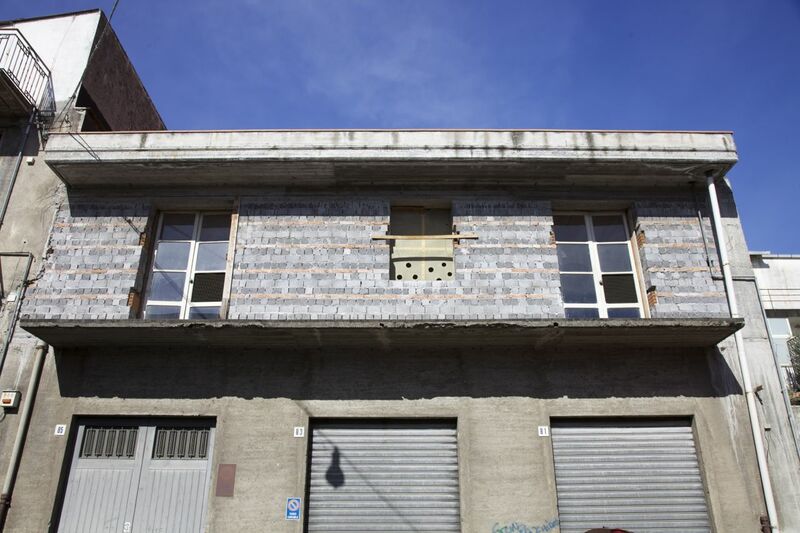 Documented by the artists’ collective Alterazioni Video, Giarre is home to no less than 25 incomplete public buildings, dating from the mid-1950s to the 2000s. Many of these are notable for their size: a vast athletics and polo stadium, designed to seat 20,000 people; a near-Olympic size swimming pool; and a five-storey cultural centre, or ‘Multifunctional Hall’. 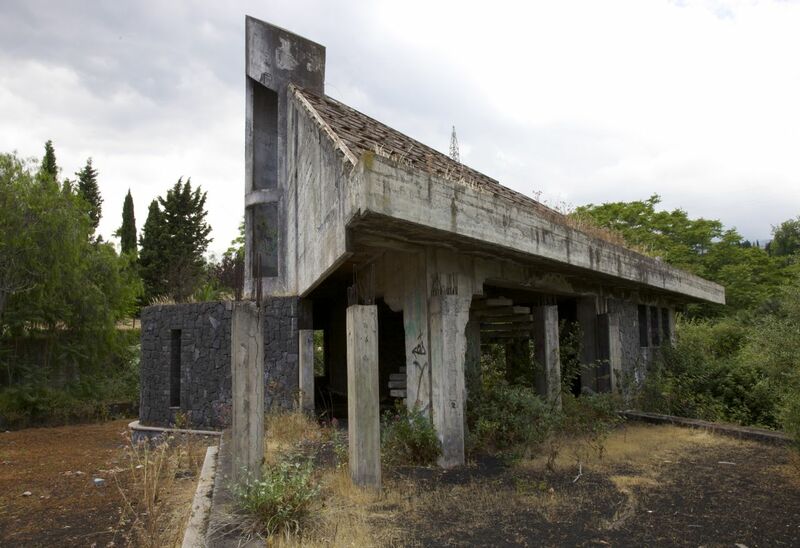 Dominated by pre-fabricated concrete frames and breeze-block infills, these structures are slowly being overtaken by meadow grass and cacti as well as being coated in fine layers of solidified black ash from nearby Mount Etna, Europe’s most active volcano. 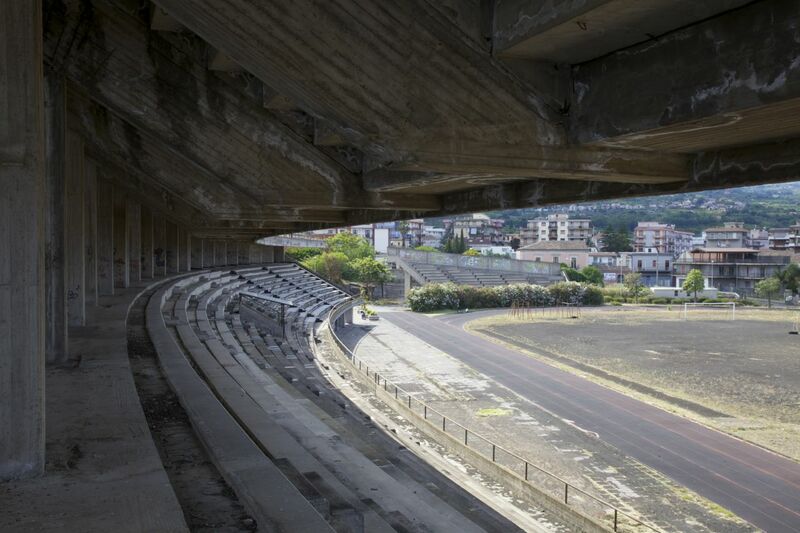 Although the rationale behind some of these projects is difficult to credit – a polo stadium in a country where few have much interest in the sport, and a hospital completed after 40 years only to be closed down again as part of the rationalization of Sicily’s health service – the concentration of them in Giarre speaks of the absurdities that result when political ideology is wedded to construction. For, during Italy’s post-war boom years – from the 1950s to the 1970s – private companies succeeded in dominating municipal governments where the measure of politicians’ success was their ability to bring building projects to their town. The money, employment and prestige that followed became ends in themselves, the buildings deliberately left unfinished so that the contractors could keep the funds flowing into the local economy. As revealed by Alterazioni Video, there may be a high concentration of such projects in Giarre, but the phenomenon extends across Sicily and, to a lesser extent, the whole of Italy – of the 400 or so unfinished projects surveyed by the artists’ collective, 160 are in Sicily alone. 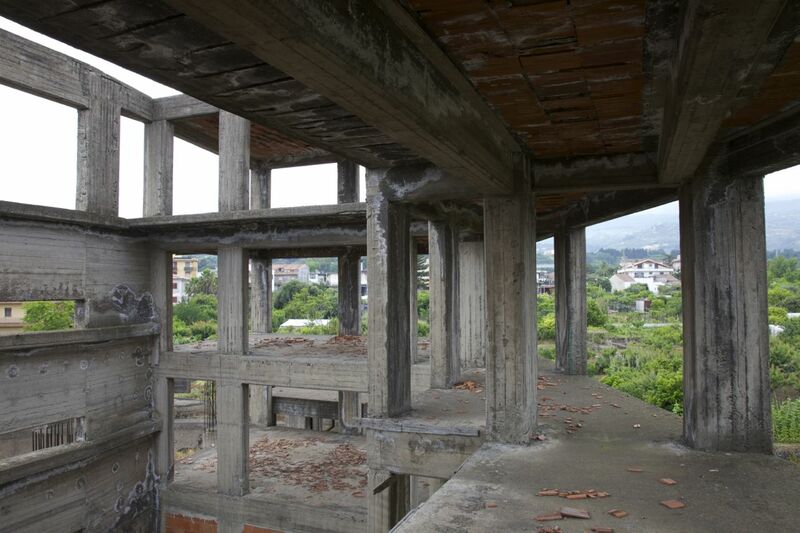 In 2008, some of the incomplete public buildings in Giarre were reclassified by Alterazioni Video as the ‘Archaeological Park of Sicilian Incompletion’, an attempt (in consultation with the town’s municipal authorities) to provide these unfinished architectures with a new cultural identity as heritage. This process culminated in a community-based festival in Giarre in the summer of 2010: tours were offered of the town’s new ruins, and playful re-appropriations of their spaces took place, such as a polo game and chariot race at the athletics stadium, and a mock-swim in the town’s empty pool. 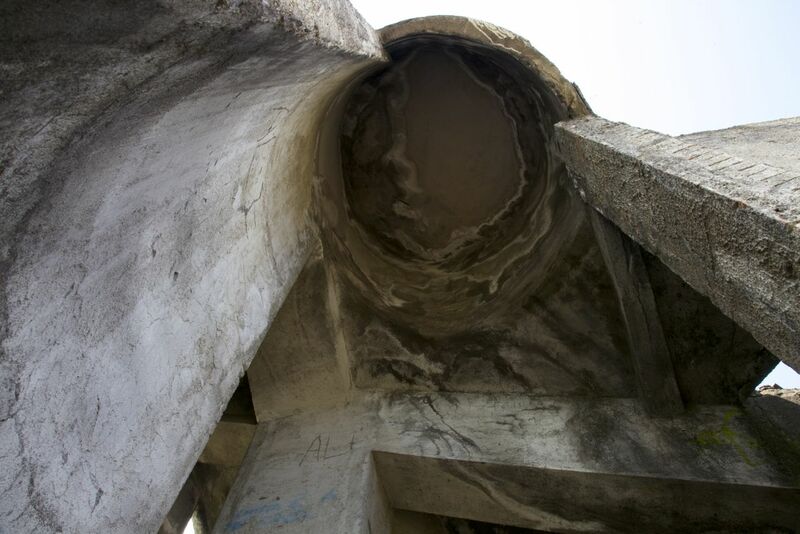 The festival ended with the ceremonial cutting down of a concrete pillar and its removal to Venice as an exhibit in the 2010 Architecture Biennale. In early summer 2015, I used the tourist map published by Alterazioni Video in 2010 to guide myself around Giarre’s new ruins, which, together, form a remarkable collection of incomplete buildings, including: the vast concrete walls, buttresses and cantilevered stairwells of the athletics and polo stadium, started in 1985; the more diminutive but no less extravagant children’s play area in the Chico Mendez Park, begun in 1975; the Regional Swimming Pool (from 1985) with its cavernous concrete interior being slowly invaded by hardy creepers; and the Multifunctional Hall next door (1987), with its skeletal concrete frame and open-air amphitheatre being overtaken by grass and volcanic ash. Even as these projects remain unfinished, others shown on Alterazioni Video’s map, such as a multi-storey car park (1987) and a theatre begun in 1956, had been moved further towards completion, thus effectively negating their status as ruins. Indeed, throughout my tour of Giarre’s unfinished structures, I felt acutely aware of just how difficult it is to categorize them as ruins. On the one hand, both the swimming pool and Multifunctional Hall have many of the qualities of conventional ruins: a silence and emptiness that leads to contemplation; signs of reclamation by nature; and pleasing patinas of decay (principally stained concrete). 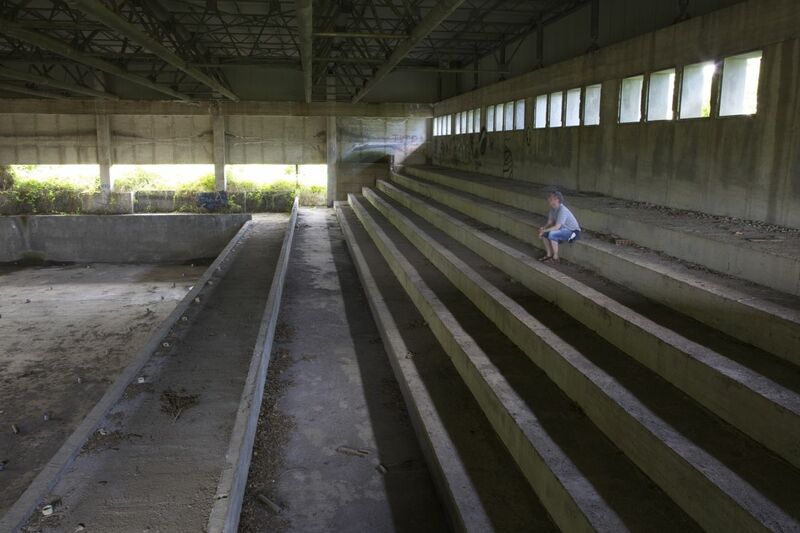 On the other, parts of the athletics and polo stadium are used by the local population – a new running and cycling track circles the gargantuan concrete stands; while the crumbling concrete structure in the Chico Mendes Park is sited right next to a new playground and café. Indeed, as the geographer Alastair Bonnett discovered in his own visit to the town in 2013, many of the Giarre’s new ruins seem to merge with the rest of the town; once paid attention to, abandonment suddenly reveals itself to be everywhere – in the half-built houses that litter the town and surrounding areas; in the unfinished extensions to apartments and houses; and in the neglected spaces of the town such as a roundabout next to the Chico Mendes Park. 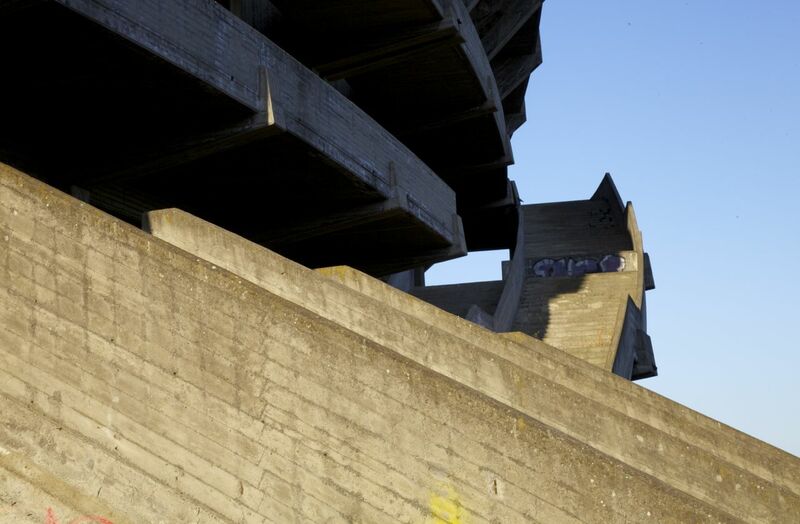 Such a realisation – that abandoned structures are everywhere and melded with lived space – raises questions not only about what constitutes ruin in the built environment (and the nature of the processes that ‘produce’ such ruin) but also the future of structures and spaces that seem to serve no function. These questions have informed the work that Alterazioni Video have done in transforming perceptions (and uses) of Giarre’s unfinished buildings. Rather than drawing attention to the incomplete as redolent of failure, the artists instead embrace Giarre’s new ruins as ‘open to the imagination of the people’ because of their very redundancy in terms of a ‘declared function’. Referring to Italy’s ‘thousand-year philosophical tradition’ of generating ‘places for spiritual habitation and contemplation’, Alterazioni Video argue for an incorporation of new ruins into such a tradition, one that reads them as ‘places of existential awareness, embodiments of the human soul’. This may read like an attempt to romanticize Giarre’s new ruins – to appropriate them into the long history of aestheticising ruins as sites of pleasure; yet, the artists’ project is also grounded in a political reading of Giarre’s ruins as ‘landmarks’ to the ‘laissez-faire creative enthusiasm’ that characterized Italy’s economic boom years. The Archaeological Park of Sicilian Incompletion creates monuments out of new ruins in order to draw attention to the longer cycles of creative destruction on which both capitalism and urbanisation are based. 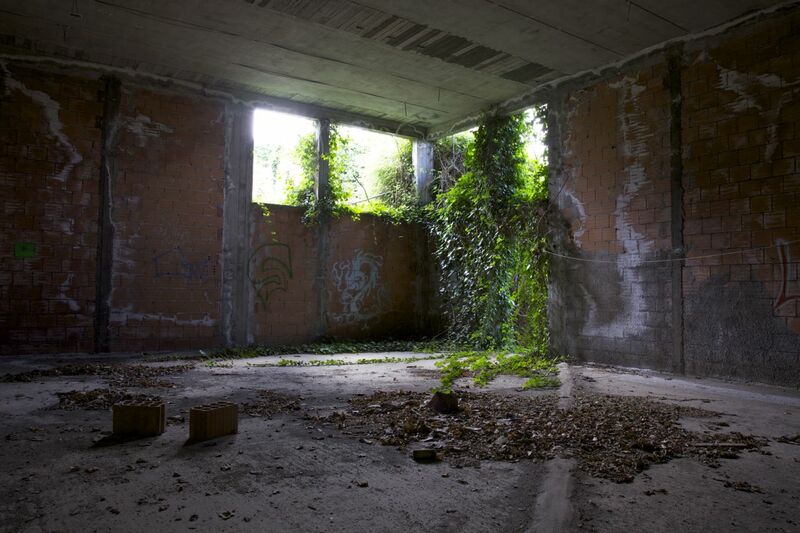 In claiming back Giarre’s unfinished buildings as sites for the imagination, Alterazioni Video are, in effect, offering a way of inhabiting these ruins, of turning them into lived rather than dead spaces. 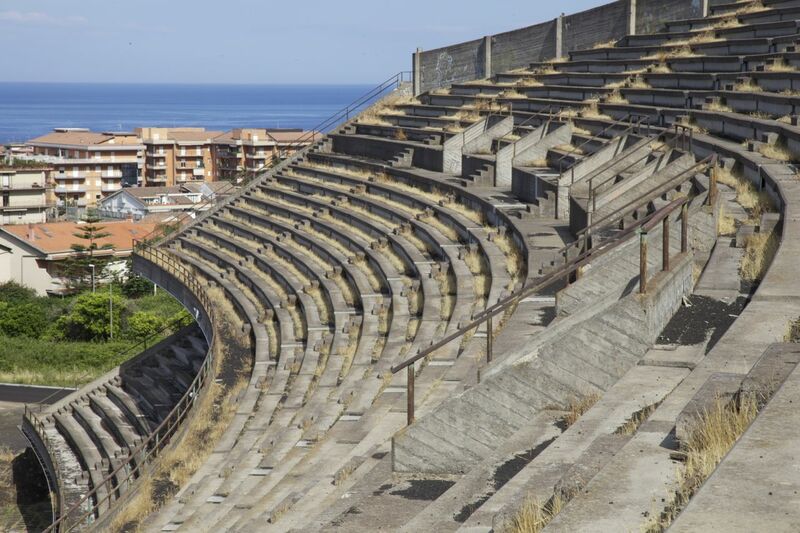 Fascinating and thoughtful piece – the idea of Archaeological Park of Sicilian Incompletion is an ingenious and humorous way of offering new meanings to these places. The context in which they were built is also interesting – built from hubris and corruption perhaps (I wonder how much was influence the mafia had on these decisions) but maybe it worked in a way by injecting money, a sort of semi-futile purpose and jobs into the local economy. Must have been a fascinating trip. Thanks Alex. Difficult to know if organised crime was involved in these projects – I don’t think so myself. In a way, all new construction is speculative – and these unfinished buildings flag up the vulnerability of the act of building itself. Really interesting article. I’m doing a dissertation on incomputo Siciliano, could you give me details of the other incomplete works in Sicily, please.